Here’s your video introduction to Lesson 7.5, Call Signs, in the ARRL Ham Radio License Manual. After watching this video you will be better prepared to understand the material in the book. Don’t forget to check the test questions! There are some corrections to the video below. At time 2:23: No, Dave, you missed one. US amateur radio call signs can begin with A, K, N, or W. You left out K. You should know better, because your own call begins with a K! At time 2:26: Ya got it backwards, Dave. It’s true that the USA doesn’t have all of A, but it does have AA through AL. So, for example, AA1A is a valid USA ham radio callsign, but AK7X is not. At time 3:57: Dave, you should check these things before saying them. Zaire is now known (again) as the Democratic Republic of the Congo. At time 4:02. Aw c’mon! It’s one of your favorite QSL cards! The country code for what was then Zaire is 9Z. See the image below for the QSL card in question. 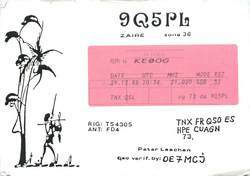 9Q5PL QSL Card, one of my favorites, dates back to 1989. After finishing the video, you can return to the list of lessons by clicking here. BTW, the backdrop for this lesson is a picture I took from the “Blowout” looking south and down into the city of Ouray, Colorado. I was helping Chris DePuy, WBØITG, put up antennas to support the Hard Rock 100 race’s communications needs. This entry was posted in Ham Radio blog entries, Technician Class License Training and tagged ham radio license training. Bookmark the permalink. Dave love the videos, the guy with all the corrections is definitely compensating for something! Why can’t people just say good job or keep it to themselves ?